This is the third coloring book I have by artist Chinthaka Herath. Once again, the focus is on the female form. This time, however, there is a glimpse of dragons which are the companions of the “dames” of fire and water. The story of the book is the epic battle between these two elements… though water puts out fire and fire only turns water to steam. Steam evaporates and comes back down in the form of rain, i.e., water. Fire is out and doesn’t come back again until a new fire is started. So, I place my bets on the outcome (in reality), on water. But this isn’t reality, this is fantasy. So the outcome is what is in the imagination of the artist. The artist’s strong female forms are emerging even stronger in this book. The crusading spirit that I saw in the last book isn’t what I see here. As I mentioned, this fantasy revolves around the fantasy of two of the four elements and that is what I see when I look at this book. The designs have a nice level of detail. Most have background of a sort included. 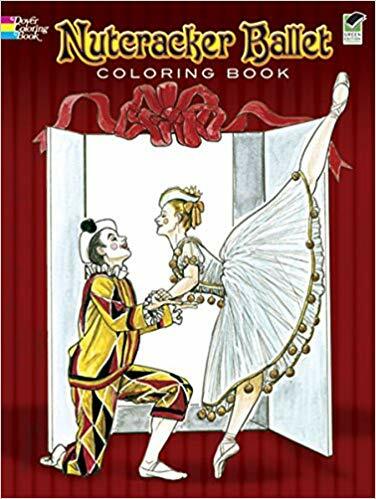 While there are more intricate areas to color in this book, I still don’t consider the book to be a difficult one or one which will tax the eyes or force you to use tiny coloring medium. 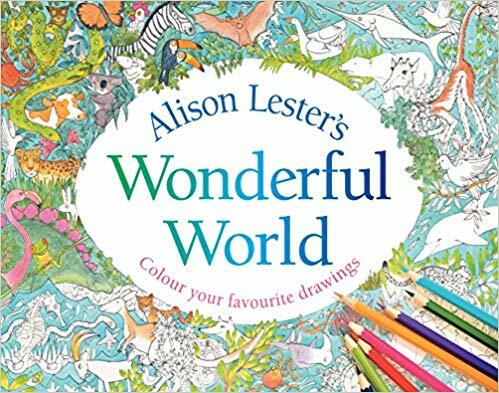 This is a 48 page book which is by children’s book author and artist, Alison Lester. 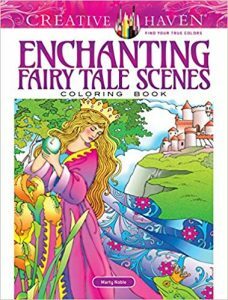 While the book blurb says that it is for 5 years old and older, the coloring is definitely for a much older child or an adult. 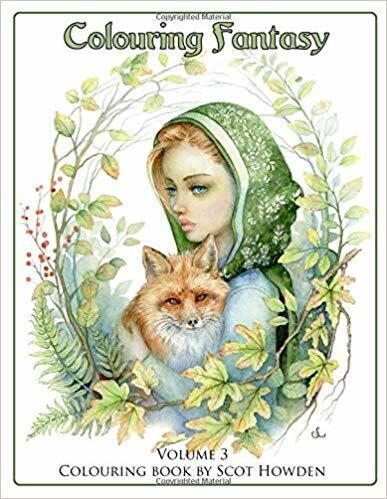 The author gives a background of how she started drawing and gives encouragement to artists who wish to draw as well. Then the book takes a right turn and becomes a coloring book rather than a book about drawing. The designs start fairly simple and then become more and more detailed. It makes for an interesting journey to see how an artist might advance in their skills. As someone who colors, it also gives you an opportunity to progress with your skills as you go along. At the end, the designs are quite detailed and intricate. They might be considered difficult to color. You can either skip those or do as the author suggests and not try for perfection. Just enjoy yourself as you color and don’t worry about the end result. The joy is in the journey, isn’t it? 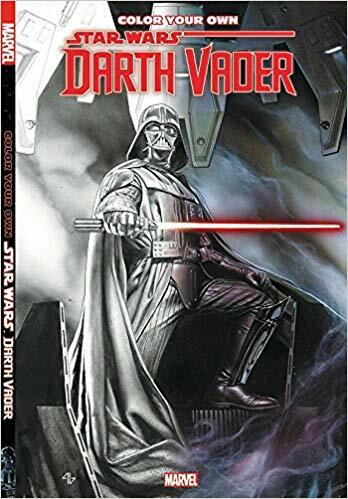 Here is a coloring book filled with images of the bad guy. Darth is at his evil best. He is creating mayhem all while dressed with a big whole helmet on his head. The designs are detailed and, in many cases, have intricate and very small areas to color. There is a heavy use of black as part of the designs. That has been true of the prior books in the Color Your Own series, so it was not a surprise for me in this book. I’ve learned to embrace the black as part of my overall design if I want to color in this series. When there is so much black on the page, I’ve also learned to be really careful if I am using colored pencils. Lighter colors over the black show up. If I use markers, that problem doesn’t happen as the color seeps through instead of sitting on the surface. As I can no longer use most markers, I will have to be careful when coloring in this book. My guess is my husband will quickly assimilate this book into his collection! This is a lovely coloring book inspired by The Nutcracker Ballet. The images tell the story of the ballet, with words on each page to provide context to the images. The coloring book is dated 2005. According to the copyright page, that was the first date this book was published. It’s hard to tell sometimes with Dover as they are inclined to publish things multiple times with slightly different titles or images. The designs are lovely and elegant and should be a lot of fun to color. However, since the book is printed on both sides of the page, coloring medium is more limited if you wish to color the entire book. The designs are open and have some detail and even intricate areas. Unlike most Creative Haven books by this publisher, there are no framing lines. However, the designs are finished with the page. There are no two-page spreads. This is a new coloring book by Marty Noble. 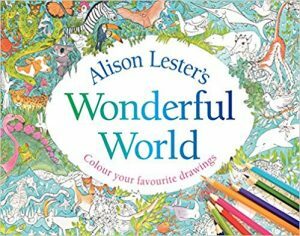 Her more recent books have shown an increasing tendency towards smaller and much more intricate illustrations. It’s gotten to the point where most of the books I buy of hers are too difficult for me to color because of the tiny, tiny elements. I have given those books away in frustration because I love her style but can’t deal with the issues involved with trying to color itsy bitsy pieces. This book is different. While it is still more detailed and has smaller areas to color than her earlier works, this is very do-able for me to color. The smaller areas are fewer and less intricate. The designs are still quite full of elements. 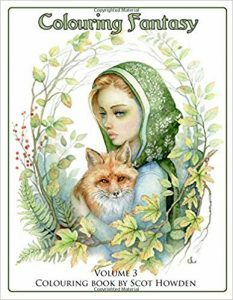 The designs are of 31 different fairy tales. Each tale has a page. I recognize many of the tales but not all of them. That will make it fun to investigate. For me, this book is definitely a keeper. Depending on when and where it was printed, Creative Haven paper is either slightly rough or slightly smooth. My copy of this book has slightly smooth paper. Many of the designs have winter fun in mind but there a good number that also focus on Christmas. I like Christmas books but wish it were more clear that that was what you could expect in this book. For some people, it makes a big difference. I like the books in this series but, unlike other such series, this one is done by different artists. While in theory, I don’t have an issue with this, in practice it feels more like the publisher is trying to cash in a bit by releasing lots of books quickly. This particular book does not have an artist attribution, which is more unusual for the Julia Rivers imprint than for other publishers. The style is very different from the last book I reviewed but it is cute and should be fun to color. There are some areas with smaller than average elements to color but not what I would consider too difficult or hard to color. This is my first coloring book by Jenn Ski though I have purchased other books from the Just Add Color series. As always, with this series, the publishing is done well. The paper is heavy, slightly rough and has perforated pages. 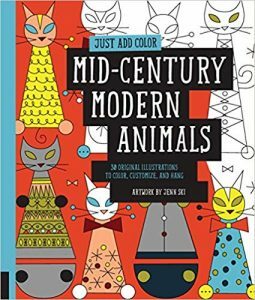 The designs in the book are of animals. The style is in that of a mid-century style. 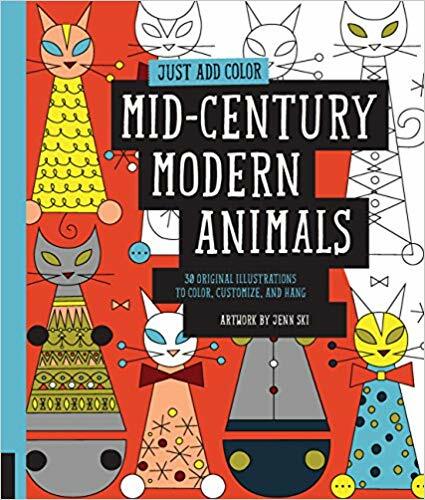 The animals are definitely stylized but it also brings to my mind, the look of folk art as well. The designs are open and easy to color. You have room to do blending or to add additional elements if you choose to do so. To be true to the mid-century look, big blocks of colors would be a great way to color. This is a set of 20 cards which are a small portion of the designs from the larger coloring book by the same name. I don’t own that book, so I can’t speak for it. However, this book has no original designs. They are all stock images licensed from Shutterstock. They may have words and verses added but I can’t verify that those are from this publisher. The designs are nice and most are Christian-based. A few are more general inspirational statements. The designs are generally detailed and have smaller elements to color. That is par for the course with small card interpretations. Fitting on the small page what originally fit on a larger page will shrink the elements quite small. I like the book and will certainly color a few but most will pass to others. 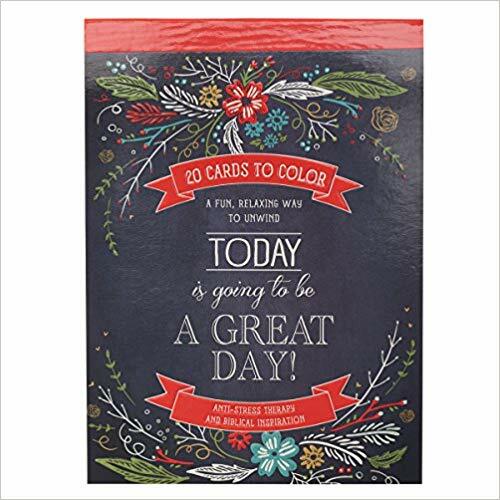 Actually, using the color cards as part of a gift isn’t a bad idea. They don’t need to be colored. 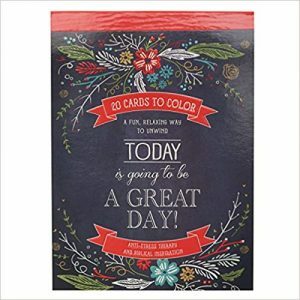 You can include the card and a small set of ten or so pencils or markers for the individual to enjoy coloring. This is the fourth book in the Dreamlings series. I own all four. I don’t know if this is considered volume 4 or if it stands outside of the general series as a seasonal one-off coloring book. 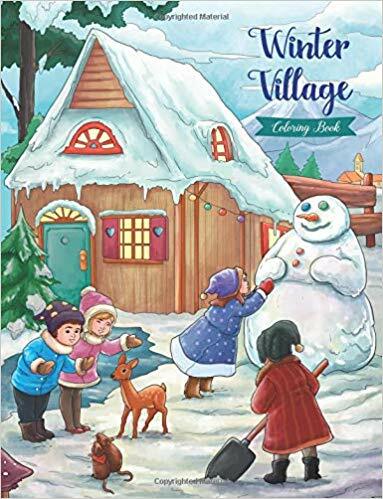 While the coloring book does contain winter scenes, it also has a big emphasis on Christmas style scenes as well. That works great for me as I like Christmas coloring books; however, I wanted to let you know in case that is an issue for you. The designs are mostly of animals though there are a couple of girls, snowmen and even a gingerbread man as well. I enjoy that the animals are shown with a Christmas tree and even as ornaments on the tree itself. The designs are easy to color and include a nice background. While they have a nice amount of detail, I do not consider it a coloring book of detailed designs. 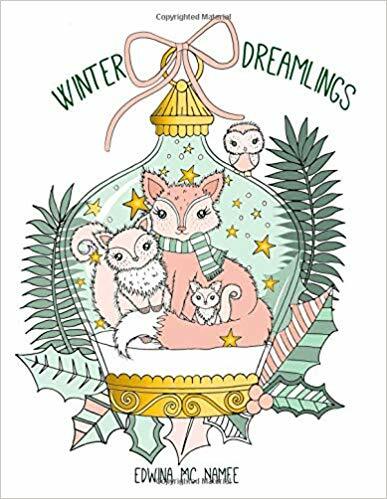 As usual with the Dreamlings series, the designs are printed twice – once with black lines on white paper and the second time as white designs printed on black paper. The change up in the background color makes coloring the second copy a new experience. 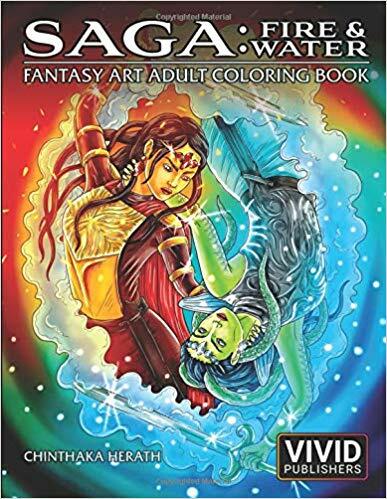 In addition to the two copies of designs, the purchase of this coloring book also includes a free download .pdf. The instructions for downloading are in the book. ys, his designs have an ethereal quality to them that is really wonderful to color. 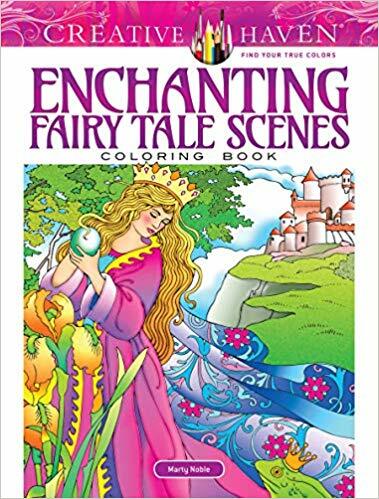 The designs in this book are a range of women in fantasy, such as fairies. I’ve given a few of the designs my own names, such as Braveheart which he calls Thistle; fairy on an old shoe, which he calls Daydreaming; Hey, I’ve misplaced my Eye again, which he calls Momento; and Joan of Arc, which well, he calls Joan of Arc, too. He’s got his girls clothed which, in his original art, may not always be the case. I appreciate it, Scot, as my grandchildren rummage through my books and I’d have to cut out pages which would be a shame.